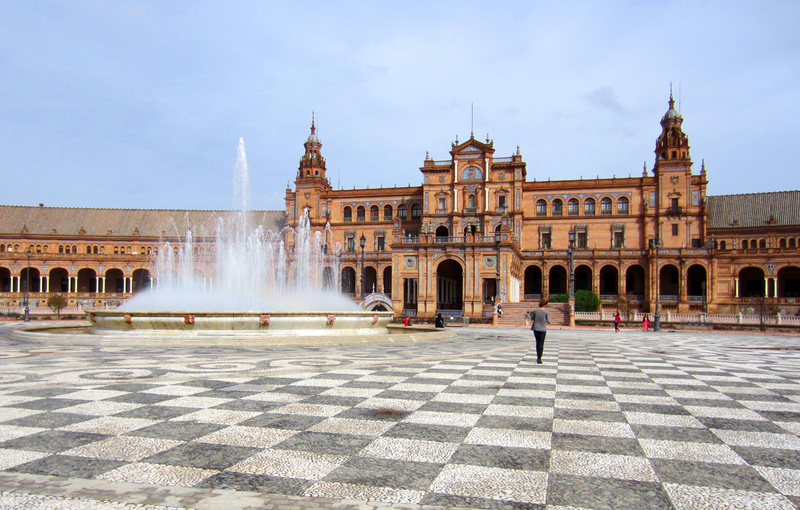 Sevilla has all of the elements of quintessential Span: beautiful tile work, quaint streets and squares dotted with orange trees, bullfights by day, flamenco by night and plentifully tapas that pair perfectly with wine. 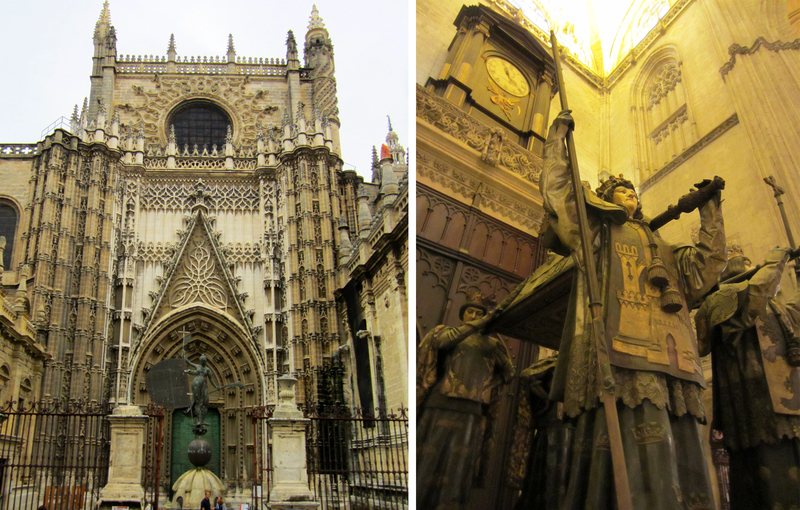 This was becoming a reoccurring theme during our 2-week trip to Spain, but something about Sevilla made it different. Call it the Spanish equivalent of je ne sais quoi, there was a certain charm in the air. Despite it being the 4th largest city in Spain (and former gateway for New World explorers like Amerigo Vespucci and Ferdinand Magellan), today’s Sevilla feels regal yet relaxed. Even though my introduction to the city was brief – a daytrip from Madrid by way of Cordoba, which I also highly recommend – its character was apparent. While there was so much more to see than my half-day allowed, here is a snapshot of a few of my favorite places. 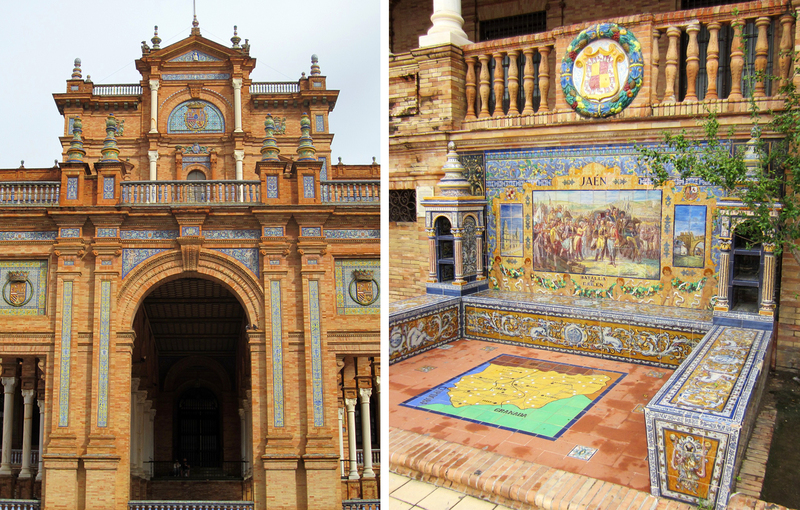 After arriving at the Santa Justa train station (following a 45 minute train ride from Cordoba), our first stop was Plaza de España. Before we hit the streets, we picked up a free map at the tourist information office in the station, located right above tracks 6 and 7. The man working the counter was super sweet and extremely helpful, taking the time to circle major sites and bus routes. To save some time, we took the C1 circular bus line from José Laguillo in front of the train station to the Prado San Sebastián stop, and then walked another 5 minutes or so to our destination. 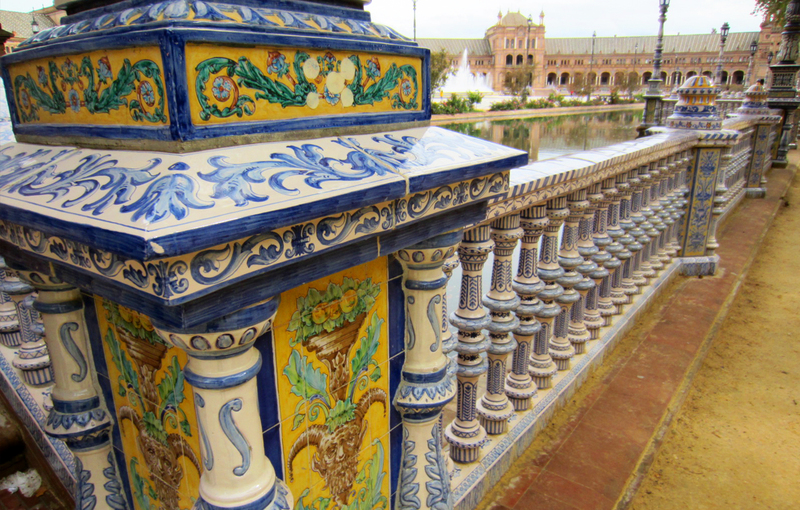 Plaza de España dates back to the 1929 Ibero-American World’s Fair that brought together Spain, Portugal and several countries from the Americas for the year-long event. 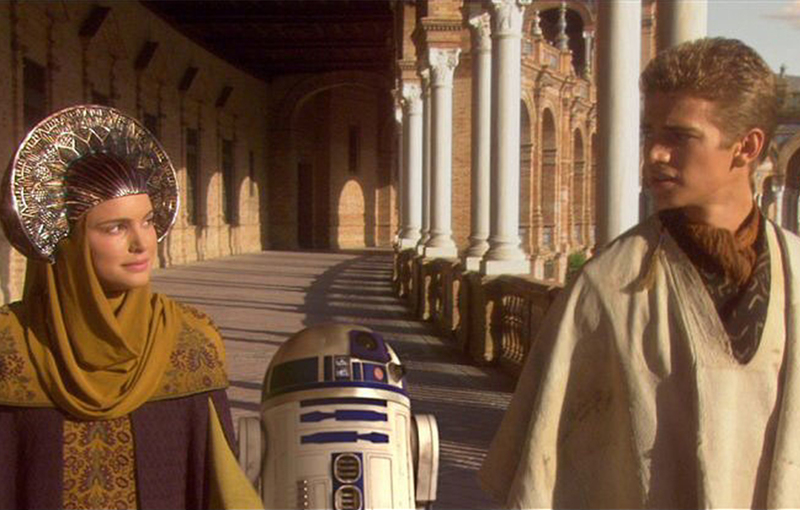 It’s also been featured in a handful of movies including Lawrence of Arabia (1962), Star Wars: Episode II (2002) and most recently The Dictator (2012). Look closely, this distinctive half-circle plaza is almost entirely covered in beautiful blue, yellow and white hand-painted tile, from the bridges and railings to light poles, stairs, fountains and benches. It was love at first sight. Along the back wall, the “Province Alcoves” depict historical scenes and maps from each province in Spain, arranged alphabetically from Álava to Zaragoza. At first we didn’t realize how compact Sevilla actually is, so we were able to spend the rest of the day on foot rather than taking the bus or tram. From Plaza de España we walked down Avenida de la Constitución to the Sevilla Cathedral. Built on the former site of a mosque, the church is significant for several reasons: 1) it’s the third largest church in the world after St. Peter’s and St. Paul’s, 2) it’s the largest gothic cathedral in the world and even holds a Guinness World Record for having the largest area and 3) it’s the final resting place of Christopher Columbus (quite the impressive tomb!). Since it was towards the end of the day, the cathedral wasn’t very crowded, which was perfect for our climb to the top of the Giralda bell tower. Of all the towers I’ve climbed in Europe to date, this was the first one that did not have stairs. Rather, it consists of 34 switchbacks zigzagging up 330 feet to the top of the tower, designed so that horses could also make the climb. It was a treat to peek out the widows along the way, catching a glimpse of the occasional jutting gargoyle and the orange tree-filled cloister below (one of the only remnants of the former mosque). When we finally reached the top (hello calf workout! ), we were rewarded with a sweeping 360-degree view of the Sevilla skyline against gray cloudy skies. 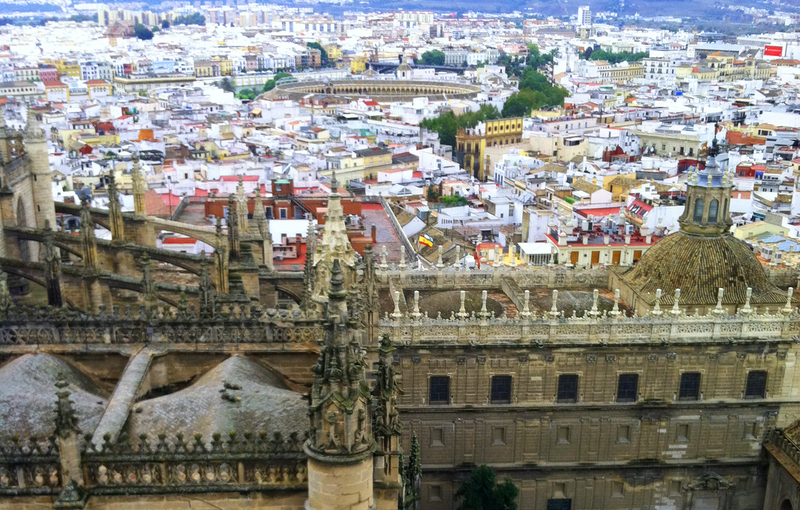 We spotted Sevilla’s bullring from the cathedral and made our way there next. Even though Pamplona is most often associated with bullfighting, the sport is also a huge part of the Sevillian culture. 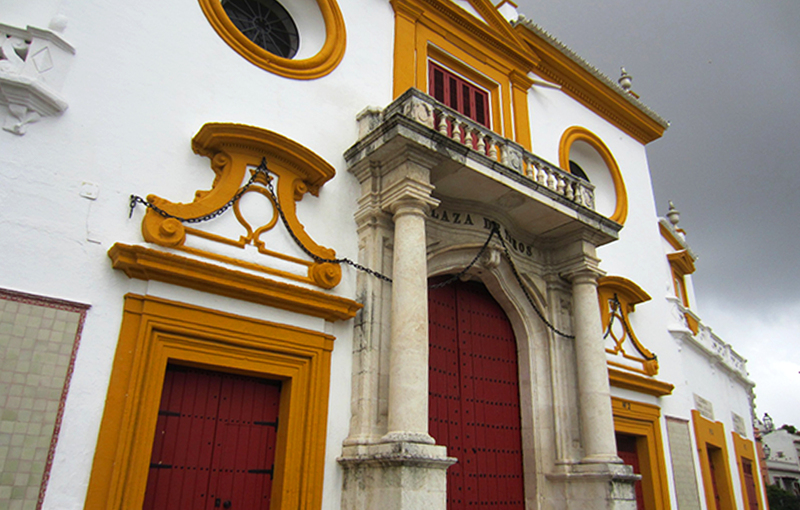 The Plaza de Toros de la Real Maestranza bullring dates back to the mid-1700s, and today boasts 14,000 seats and its own museum. It took more than 120 years to build, resulting in an irregular polygon with 30 unequal sides (rather than a perfect circle) due to the variety of construction phases over the years. The bullring has a fascinating history, which you can read more about here, including a 60-year construction hiatus surrounding King Carolos III’s bullfighting ban in Spain. Around the back side of the bullring we discovered the Antonio García hat shop, which is literally part of the same red, yellow and white building, with beautiful black rod iron balconies above the entrance. The García family has been synonymous with millinery in Sevilla since 1847, and the shop was filled with a variety of traditional handmade headgear and accessories for both men and women – basically everything you would need to build a respectable matador wardrobe, fitting given the shop’s location. It also proved to be a great place to do some early Christmas shopping for family back home. We did a little more shopping as we wandered through the maze of streets in the old Santa Cruz neighborhood. At this point, it was time to stop for a quick bite before heading back to the train station. 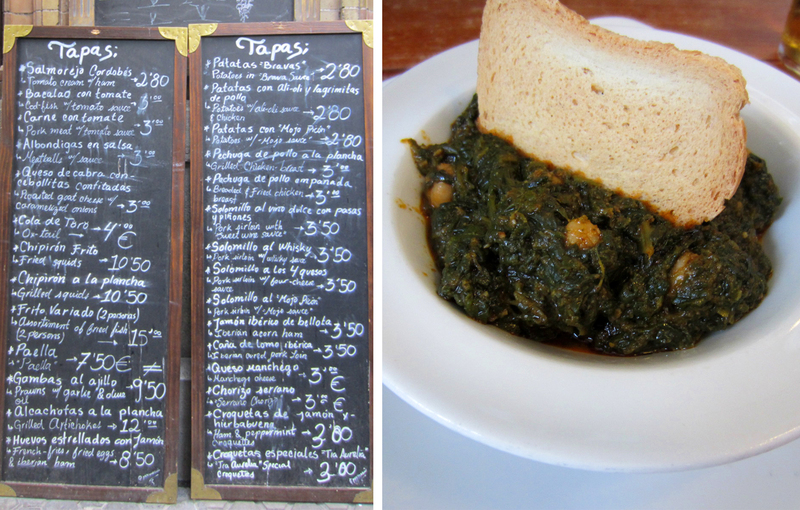 We were enticed by the tall handwritten menu boards at Casa Tomate advertising a special for 7 tapas for 17 euros. We grabbed an outside table under an orange tree (when in Spain…), and had arguably one of the best meals of our trip. The portions were hearty, the service was friendly and we left determined to recreate one particular dish when we returned home – espinacas con garbanzos (you can check out the recipe here). We were slightly stuffed and running short on time, but couldn’t pass up after-dinner coffee and dessert at Sevilla’s famous Confiteria La Campana on Calle Sierpes. There was just enough time for one more stop on our way back to the train station, the Metropol Parasol on Plaza de la Encarnación. 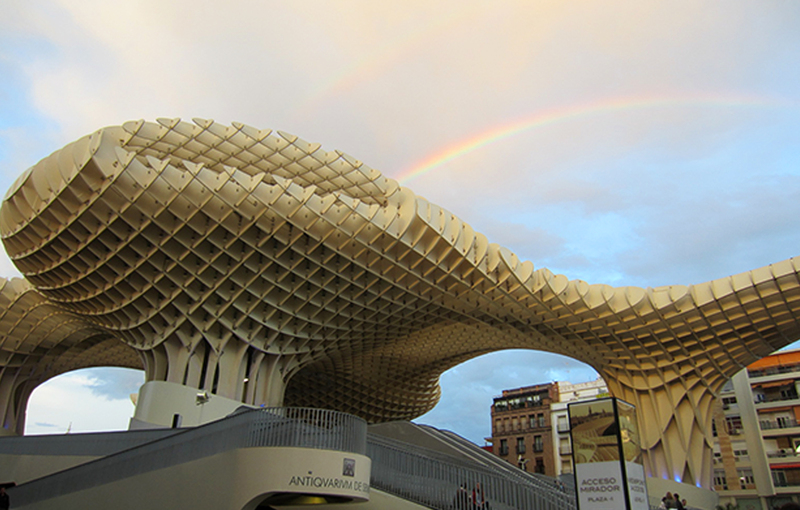 Also known as the Setas de Sevilla (which means “mushrooms”), the modern structure is made up of 6 waffle fry parasols that seem to float above the plaza below. It’s a striking contrast from the traditional Spanish architecture that permeates Sevilla, and at 490 by 230 feet wide and 85 feet tall, it’s the largest wooden structure in the world. There’s a lookout on top with great views of the city, and shops, restaurants, a food market and a small archeological museum underground. Completed in 2011, the Metropol Parasol remains controversial among locals, but so too was the Eiffel Tower when it was first constructed. 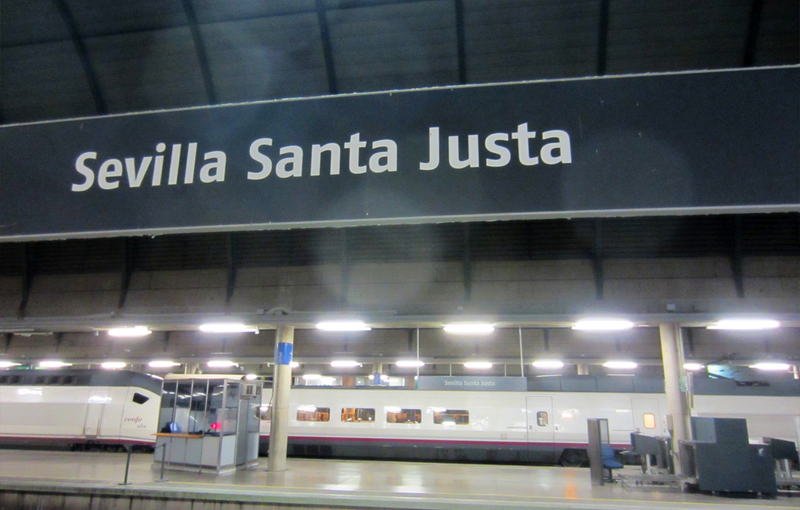 From here we were only about a 15 minute walk from Santa Justa, where we caught our train back to Madrid.